WASHINGTON, D.C. -- Americans still prefer energy conservation over production. After dwindling in recent years, Americans' long-standing preference for emphasizing conservation over production in U.S. energy policy has rebounded, now matching levels seen in prior years. Currently 57% of Americans say the U.S. should emphasize conservation in its approach to solve the nation's energy problems, up from 51% in 2013 and 48% in 2011. About one-third in the U.S. now favor greater emphasis on energy production as the solution. This latest update is from Gallup's March 6-9, 2014, Social Series Environment poll. 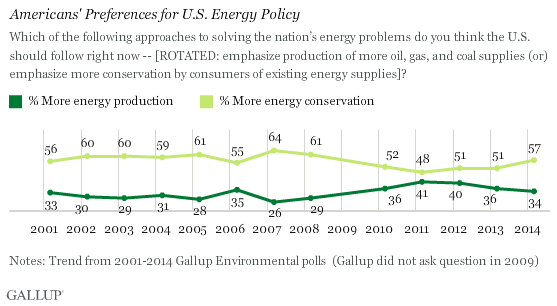 Since Gallup began asking the question in 2001, Americans have consistently named energy conservation over production. The highest percentage favoring conservation (64%) was recorded in 2007, while the lowest was in 2011, at 48%. A separate question in the survey, asked of a different subset of respondents, finds 64% of Americans prefer an emphasis on the development of alternative energy production, such as wind and solar power, to an emphasis on production of traditional fossil fuels. That is up from 59% in 2013. On this point, nearly one-third of Americans would rather the country pursue increased production of oil, gas, and coal supplies to these alternative energy options -- roughly the same level of support seen in recent years. 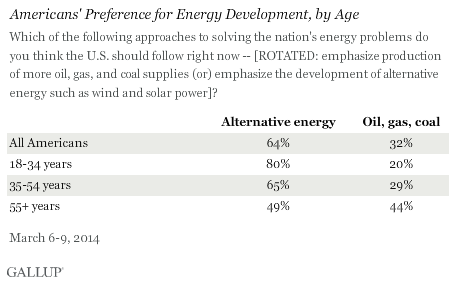 Young Americans are highly likely to emphasize the development of alternative energy, and the older age groups each successively favor it less. In fact, slightly less than half of Americans aged 55 and older favor alternative energy, roughly equal to the support in that age group for traditional fossil fuels (44%). 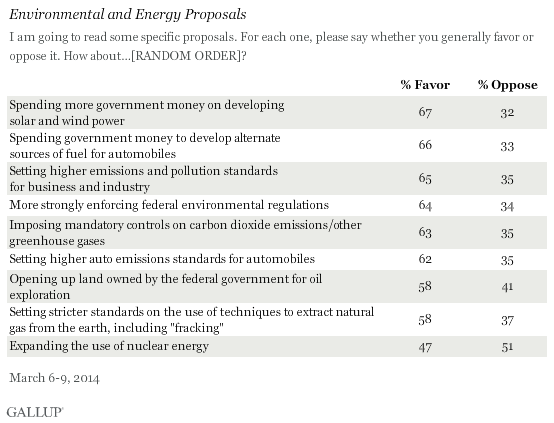 Americans' collective interest in alternative energy sources is reinforced by the responses to a question asking Americans if they favor or oppose nine specific proposals dealing with energy and the environment. Two-thirds of Americans favor increased government spending to develop solar and wind power, and spending more to develop alternative fuels for cars has the same level of support. Additionally, more than 60% of Americans favor a variety of proposals that would regulate or limit fossil fuel emissions, including setting higher pollution standards for business and industry. These results are consistent with Gallup's earlier findings that Americans prioritize the environment over economic growth. At the same time, the majority of Americans favor the idea of opening up land owned by the federal government for oil exploration. This break from a more conservationist view is consistent with Americans' support for other proposals to increase oil and gas production, including support of offshore drilling. Expanding the use of nuclear energy is the only proposed policy that the majority of Americans oppose, albeit by a slim margin. Attitudes toward this question have remained more or less unchanged since 2001, when 51% of Americans opposed it, except for a brief increase in favorability in 2006. Americans continue to see alternative energy and energy conservation as better approaches to addressing the nation's energy problems than producing greater supplies of traditional energy like oil, coal, and gas. In recent months, President Barack Obama has announced several new initiatives that tighten environmental regulations, such as increasing the fuel economy standards for heavy-duty vehicles and a strategy to cut methane emissions. The Obama administration's 2015 budget proposes significant funding for environmental research, including a new $1 billion climate resilience fund meant to help communities across the country adapt to the impact of climate change. However, these proposed changes will come under considerable scrutiny from congressional Republicans. Gallup has consistently found that Democrats are typically more in favor of environmental regulations, while Republicans often oppose them. While Obama has promised to use unilateral executive orders to initiate new policies, the 2015 federal budget cannot pass without bipartisan support. Results are based on telephone interviews conducted March 6-9, 2014, with a random sample of 1,048 adults, aged 18+, living in all 50 U.S. states and the District of Columbia. For results based on this sample of national adults, the margin of sampling error is ±4 percentage points at the 95% confidence level. For results based on the sample of 535 national adults in Form A and 513 national adults in Form B, the margins of sampling error are ±6 percentage points. Interviews are conducted with respondents on landline telephones and cellular phones, with interviews conducted in Spanish for respondents who are primarily Spanish-speaking. Each sample of national adults includes a minimum quota of 50% cellphone respondents and 50% landline respondents, with additional minimum quotas by region. Landline and cellphone telephone numbers are selected using random digit dial methods. Landline respondents are chosen at random within each household on the basis of which member had the most recent birthday. Samples are weighted to correct for unequal selection probability, non-response, and double coverage of landline and cell users in the two sampling frames. They are also weighted to match the national demographics of gender, age, race, Hispanic ethnicity, education, region, population density, and phone status (cellphone-only/landline only/both and cellphone mostly). Demographic weighting targets are based on the March 2013 Current Population Survey figures for the aged 18 and older U.S. population. Phone status targets are based on the January-June 2013 National Health Interview Survey. Population density targets are based on the 2010 census. All reported margins of sampling error include the computed design effects for weighting. Roughly half of Americans say President Barack Obama is doing a good job of protecting the nation's environment, while fewer approve of his job performance in making the U.S. prosperous or improving the nation's energy policy. Do you think Barack Obama is doing a good job or a poor job in handling each of the following issues as president? How about -- [RANDOM ORDER] Protecting the nation's environment, Improving the nation's energy policy, Making America prosperous?